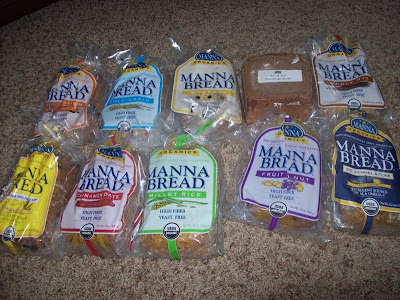 Manna Bread send me a whole bunch of their little loaves of bread to try for review. Their breads are "cake-like, sprouted bread, yeast free bread, organic bread, free of salt, no oils, no sweeteners, no leavening agents. Manna is a moist and delicious, high in protein and fiber. Available in 9 delicious flavors in your favorite health food store, and most Whole Foods markets, in the USA and Canada.". Right when I got the breads in the mail, I broke out a piece of the multi grain flax sourdough bread. I loved the taste of bread and the ingredients are so healthy! The bread as described is extremely dense which I liked. I like the bread toasted with some margarine on it. For one piece, there are 150 calories which is high to me if you are eating a sandwich or something but to have it alone is not bad because it is very filling. I am very impressed with the breads and am excited to try some of the other flavors such as the carrot raisin bread and the banana walnut hemp bread! Thanks Manna Bread for all of the awesome little loaves of bread! I love them!